Parallel hybrids don’t excite me – there is something conceptually clumsy about them, although I admit that a ride in a Prius was a pleasantly uninvolving business. My preference, based on what seems an elegant future solution rather than the state of current technology, is for a car that has a reasonable range in pure electric form around towns with a mini-turbine powered generator for potentially infinite range extension. However at present we seem to be reliant on the old reciprocating internal combustion engine for on board power. I’ve even seen people on websites berating those who want to cure their range anxiety with supplementary power units as wimps – man up, go 100% Electric. Nice idea but, unless I get a very long extension cable that isn’t going to happen. To retort to the 100% electric macho brigade, if your life is so perfectly ordered that, when you wake up each morning, your day stretches out before you perfectly planned, with each kilometre to be travelled neatly accounted for, well done. Mine doesn’t, and I know many others who don’t, so I can’t rely on keeping within a finite range. Like many, the BMW i3 was the first EV that I really felt attracted to. The production version disappointed slightly aesthetically, but it still remains an attractive package on paper except for the suspicion that rear seat passengers might hate me and for the nature of the range extender. The rough little scooter engine is strictly a limp-home device. Even disregarding the fuel tank size, it can’t generate enough power to guarantee to keep you out of the slow lane on a motorway. Obviously BMW are aware of this and, although they can be congratulated on getting the rest of the car into place so quickly, the range extender is a rather tacky and cynical afterthought – a 10 year old range-extender i3 (or maybe even a 3 year old one) will surely be viewed as a snapshot of work-in-progress. So if you’re in Central London and you get a call to get down to Bristol in a hurry, just leave the i3 at the side of the road and get a train – which, of course, you can rightly point out fits in with the ethos for getting an EV in the first place but would not suit me, especially if I had a boot full of things to transport. Strangely, the one EV that currently addresses these issues most convincingly is being withdrawn by Opel/Vauxhall, giving countless motoring editors the chance to write “Vauxhall Pulls The Plug …..”. The Ampera, a development of the Volt that continues in the USA, has a complex system, which confuses and offends those in search of a pure EV, but which affords you the potential of limitless range, allowing for fuel stops, without real-world compromise. I can’t help but feel that antagonism towards General Motors, which, bearing in mind its history is not entirely undeserved, has coloured acceptance of this car. And brand snobbery, of course. In the UK the Ampera wasn’t cheap but, if you want to be an early adopter of anything, you end up paying a premium. Actually, from £28,700 new (though the price at launch was higher) it seemed a reasonable price to me for a well thought out solution, especially compared with the smaller, stylish but compromised i3 range extender (£29,000), the all electric Tesla (from £49,000) and the Prius Plug-In (£28,000). Had it the spinning propeller badge on the front, I think take-up would have been far greater. The Kylie Minogue Effect : If you want your car to look spacious, secure the services of a small singer, in this case Katie Melua. Sitting in the car, it’s comfortable and smartly designed. The positioning of the battery in the area that would house a transmission tunnel makes it strictly a four seater with not as much room in the rear as you might imagine, but it has reasonable luggage space and folding seats. The view out is, of course, woeful, but I could say that of so many shallow-windowed, thick-pillared contemporaries. From the outside it’s distinctive and the front view works well, but the shiny black strip beneath the side windows doesn’t really hide a certain slab-sidedness and, certainly, it doesn’t make the windows any bigger. Its powertrain suggests a 50 mile range on electric power but, as with all EVs, this probably assumes that you are driving conservatively, in daylight, with no air conditioning and without having the Bose sound system on maximum volume, and the figure achieved is likely to be nearer to 35 miles, which is still more than many daily commutes. Once this is used up, and assuming you can’t stop and recharge at a socket, the petrol motor, a more substantial device than that of the i3, comes into action and at this point things become more complex. 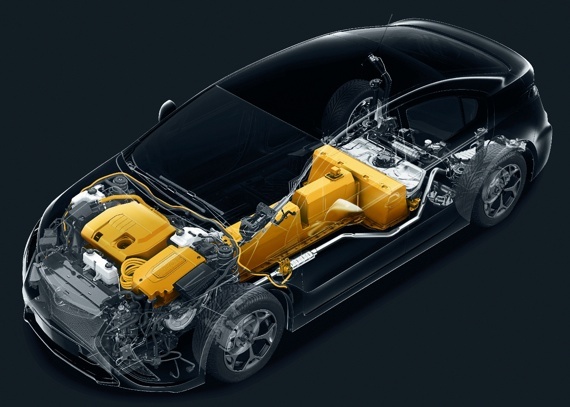 There are two electric motors, one for lower speeds, one that cuts in at higher speeds. The petrol engine first starts driving this second motor, turning it into a generator, so at this point the car is a series hybrid. Finally, as speeds increase further, some of the engine’s power is sent direct to the wheels by means of a planetary gearbox so that it becomes, in part, a parallel hybrid or maybe more exactly a hybrid hybrid. This might seem complex, but it probably deals with the issues that restrict the everyday usability of an EV in all conditions better than anything else currently around. 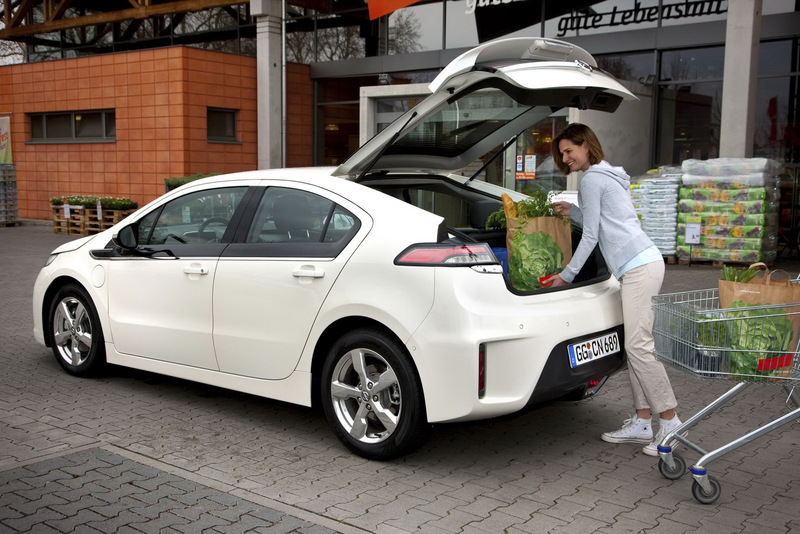 Currently, you can pick up a 2 year old Ampera for around £18,500 with the remains of an 8 year battery warranty. Typically it might have covered 20,000 or more miles and you can look at that two ways. First, that you’d have expected an EV to have covered less miles in such a short life. Second that it’s a testament to its usability. I tend towards the latter. Looking at figures, in that 20,000 miles the car has possibly saved its owner less than £1,500 in fuel bills (plus road tax and, possibly, congestion charges) over a cheaper equivalent new car with a modern, miserly diesel, but the progress of the Ampera will have been far less rackety. If running costs are your bottom line, and you factor in depreciation, an EV still remains an outsider choice. But it’s one I think I’d be happy to live with even if, when I do the crude mathematics, I might have to drive 60,000 miles before any savings had paid for the difference between it and the guzzling Audi. I have a brochure for the Ampera on my desk. Obviously written when GM were feeling optimistic for its chances in Europe (“Resistance Is Futile!”), it makes sad reading now. EVs aren’t going to vanish, and I guess that a GM EV will return to the UK but, by then, their offering, like most other GM products, won’t stand out and will be just a safe version of whatever everyone else is offering. Unfortunately Honday never saw fit to install that drivetrain in another model (not even a Civic), which is disappointing somehow. Laurent – wasn’t the same drivetrain available in the recently deceased Insight? That’s the Pruis-like Insight, not the charming original rear-wheel spatted coupe. Maybe. Part of the CR-Z USP was the manual transmission which appeared nowhere else. Laurent – you are quite right, I had overlooked that fact. Sean is being very tolerant of the Ampera. I can overlook the asinine black trim under the sideglass but not the excesive complexity of the engine system. There are quite a lot of people who can very easily cope with a pure EV. After a year without using a private car I realise that it’s only marginal circumstances where other means of transport fail to suffice. However, I woud guess Sean needs a diesel vehicle if he has to frequently travel long distances. I decided the main reason my household made complex multi-trip journey was because we had a car. The one thing we just never do now is go to Ikea which is 8km away on the edge of town. I call that a gain! But if I was much richer, I’d like to have an EV as they are closest in feel to the spacey strangeness I liked in Citroen. Finally, the Ampera seems to offer the worst of both world’s and resembles nothing so much as another attempt by GM USA to show progress is impossible. If Opel had been given the job it would have been very different and by that I mean better. 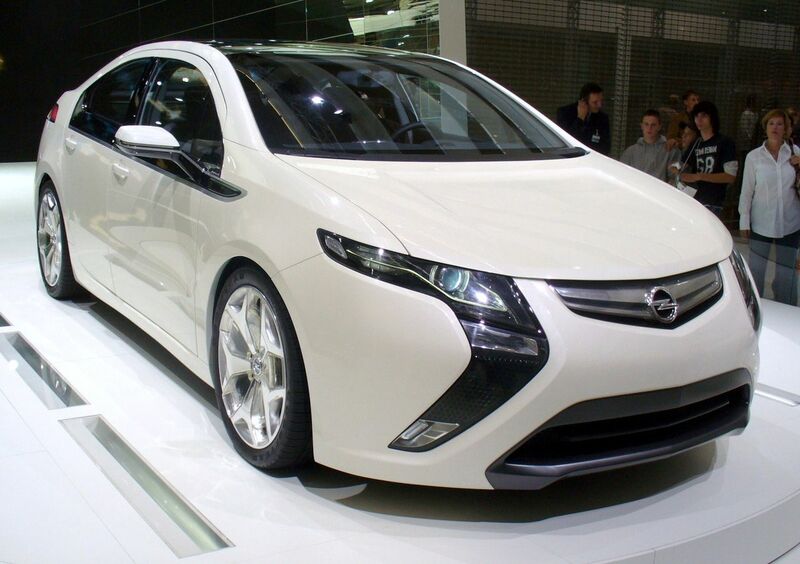 That said, the essay did explain why I might like the Ampera even if I was not convinced. Plus: I live in a dense urban area with no off-street parking. I would have nowhere to charge my EV if I had one. Conversely, most people with a space to park and recharge an EV live in suburban areas and really do need a good range. Moral: if you could get by with an EV you probably lack the possibility for recharging and if you have driveway you probably live in a Barret Homes suburban wasteland and have a 90 mile commute. 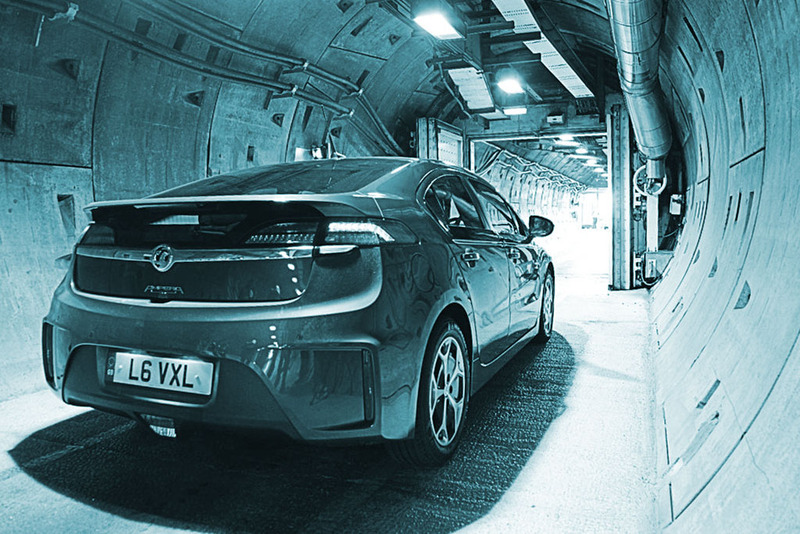 Maybe I was in a rarely tolerant mood the day I considered the Ampera but, bearing in mind that all of the current EV solutions will look rather archaic in 10 years time, I feel that the Ampera has had a bad press. Yes, it’s a complex system, but it does answer questions that other EVs don’t. Richard does bring up the paradox of EVs, for dwellers in old cities at least, that the places where they are most suited offer the least chance of keeping them charged. Like many Londoners, I live in a terraced house with on-street parking and, even if I could guarantee to park outside my own house, the practicality of dangling a power cord from a tree is negligible. Like so much regarding low emission vehicles, it’s a chicken-and-egg situation. If there was the demand, it’s possible to imagine local boroughs producing dedicated parking spaces with charging points on every street, but the lack of them at present means there won’t be a demand. My own on-off desire for an electric vehicle hasn’t really got much to do with saving money, but I do like the idea of travelling peacefully, particularly if I’m going to be limited to a stultifying speed restriction around most the city. Even though manufacturers do wonders with sound insulation, I find the external clatter of diesel vehicles offensive and their fumes unpleasant. So, although I can’t unfortunately claim not to have used, and indeed I still do use, DERV vehicles, I can’t countenance a diesel car for my personal use. On the subject of public transport, I might be being crassly xenophilic, but I imagine progress on a bus in a Danish city to be a far more civilised business than it is in the UK.